Bucharest, Sept 12 /Agerpres/ – Romania has won 27 medals and special prizes in the 10th edition of the Moscow International Salon of Innovations and Investments for 20 inventions displayed in the event by the Romanian National Authority for Scientific Research (ANCS). ANCS reports in a press release that Romanian inventors won eight gold medals, nine silver medals, three bronze medals and seven special prizes. Romania showcased 20 inventions that have practical applicability in the economy, as the salon targets the investment community. It was represented on the international jury of the event by Camelia Marinescu, adviser with the ANCS Department for Technology Transfer and Infrastructures. The eight gold medals went to the National Chemicals and Pharmaceuticals Research and Development Institute for a procedure to obtain bio-products using selenium and chrome; to Corneliu Birtok Baneasa for a dynamic air transfer device; to the Hidroelectrica SA national electricity corporation for an automatic lubricating machine; to Aurel Enache and Liviu Luca for a procedure and installation to increase combustion energy of a combustible natural gas; to the Romanian Institute for Solid Physics for a method and device for the operation and control of mobile inertial robots; to the Lucian Blaga University of Sibiu for a device for magnetic activation of processing through electrical discharge using a thread-like electrode; to the ICAA SA Research Institute for Advanced Covers for advanced nanomaterials for long-term protection of metallic structures, and to EXINVENT ROM SRL of Craiova for a water energising and plant growth stimulating installation. This is Romania’s second important success this year in the field of inventions that adds to a tally of 58 medals and special prizes won in the Geneva International Exhibition of Inventions. The 10th edition of the Moscow International Salon of Innovations and Investments was held September 7-10 under the high aegis of the Government of the Russian Federation. Organisers were the Ministry of Education and Science of the Russian Federation, the Moscow Chamber of Commerce and Industry and the TECHNOPOL Association of Moscow. The salon is an official event of the World Intellectual Property Organisation and the International Association for the Protection of Industrial Property. 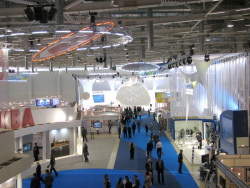 This was Romania’s second participation in the salon, after it first attendance in 2009. The pavilion of the fair hosted 1,000 inventions spread over 12,000 square metres. In addition to more than 500 Russian organisations and companies, there were exhibitors from the Czech Republic, Korea, Iran, Poland, Romania and Ukraine.